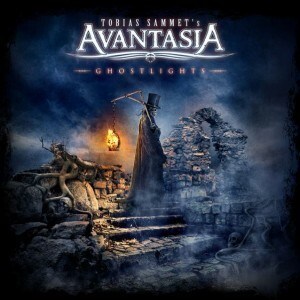 Review: Avantasia – Ghostlights – Nuclear Blast – Release: January 29th 2016. Originally started off as a side-project by Edguy’s Tobias Sammet Avantasia was just to be a great power metal opera in two parts. For fans of power metal they were pure gold, but unfortunately the project ended after two years. Luckily Tobias decided to get ball rolling again in 2006 and 2008’s “The Scarecrow” was a huge comeback. While there was quite a difference with the original albums Avantasia has since grown to be a huge act, almost overshadowing Edguy to the point you’d wonder if we’d get more Edguy stuff! Luckily there’s plenty of room for both (very different) bands in Tobias’ agenda and right now we’re at lucky number seven with “Ghostlights”. The album starts off in great Avantasia fashion with ‘Mystery of a Blood Red Rose’ which fans will have already played to death. A typical Avantasia song combining the modern sound with quite a lot of throwbacks to the classic albums. Supported by a big choir Tobias takes this song for himself to welcome you into the story that started off with 2013’s “Mystery of Time”. No time to rest though, as it gets followed by my personal highlight of the album ‘Let the Storm Descend Upon You’. Flanked by the grand voices of Avantasia mainstay Jorn ‘constant eargasm’ Lande, returning Ronnie Atkins and newcomer Robert Mason this song is has a great rock vocalist cast to give a positive vibe to a behemoth of a song, yet those thirteen minutes pass by as if it was a much shorter song. How big is the contrast with ‘The Haunting’ which starts off with a very appropriate scary piano tune and Dee Snider increasingly malevolent voice. This song has a great back and forth between grand rock opera and the aforementioned scary rock. The next song ‘Seduction of Decay’ turns into a very different lane with the expansive vocals of Geoff Tate. With a steady marching tone this song struts forward with Geoff and Tobias’ vocals walking along as if they were kings of the world. Despite its length and low tempo this song never gets on your nerve because there is enough variation in the song whilst still keeping to the marching tune. As if to make up for the lack of speed the title track ‘Ghostlights’ goes into full speed power metal in typical Avantasia fashion and is the first song on “Ghostlights” to feature the still so very impressive vocals of Michael Kiske. I really feel for Tobias having to contend with him, especially since he also gets battered by the smoky vocals of Jorn. ‘Draconian Love’ has a slightly more gothic feel to it due to Herbie’s deep resonating vocals and it’s actually the parts where the music is more subdued and his vocals get the main role that this song is the strongest for me. At first instance the slow tempo seems to be continued in ‘Master of the Pendulum’, but before long it turns into a great Edguy style banger with Marco Hietala’s magnificent maniacal vocals taking a spotlight here. I’m such a sucker for his voice, so this song’s an easy win, especially with the more folky tunes incorporated in the chorus. Time to kick back again with ‘Isle of Evermore’, a very soft almost atmospheric song which also turns out to be a warm welcome for Sharon Den Adel whom fans will surely know for her role in the first two albums. I was never that big of a fan of her voice in the past, but her voiced has matured in an exquisite way and the soft music is a perfect company for it. You guessed it, time to push the pedal to the metal again with ‘Babylon Vampyres’ which could have easily fitted on an Edguy album. Robert Mason brings the rock back again as well and with him Tobias lead the masses on in a very catchy chorus. Despite his perfect rock voice Jorn is also great in ballads as he shows off in the intro to ‘Lucifer’, a deceptive song that starts off so soft, fragile and pretty that it’s almost a sucker punch when the full band revs up and the full dramatic body of the song unfolds. Such a shame that it lasts so short, but this is a song you will keep on repeat for several times just to keep getting that rush! Almost at the end it’s time for a typical Avantasia/Edguy mashup again with Kiske bringing the power, Atkins the rock and Tobias connecting the two in a perfect union. And after this final musical explosion it’s time to end this superb album on a softer and very positive note with the classic rock-fan pleaser ‘A Restless Heart and Obsidian Skies’ starring another classic Avantasia guest, Bob Catley. What a way to end! Not going to waste any more space. Love power metal? Love rock operas? Get “Ghostlights” ASAP!! !